The Malwa Sultanate was a late medieval independent Sultanate of the Turkish origin in the Malwa region. In the present-day, it is located in the Madhya Pradesh state of India. It was founded by Dilawar Khan Ghuri, the governor of the Delhi Sultanate, who asserted his independence in 1392 CE. 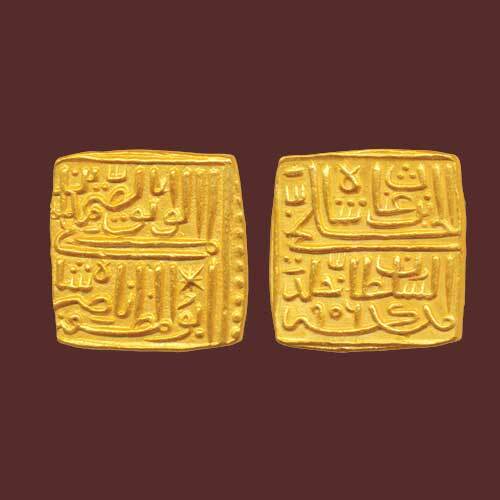 This gold square tanka was issued by Nasir Shah of Malwa Sultanate. Nasir Shah was the son of Ghiyath Shah and he ruled the Malwa Sultanate from 1500 CE to 1510 CE. Nasir Shah issued coins in all the metals like gold, silver and copper. Nasir Shah issued coins in a square shape which was a typical shape of his father’s reign. One of the gold tanka that he issued is in 'mihrabi’ shape. Some of the special issue coins were minted in silver and are round in shape. One of his silver tanka which he issued is in diamond-shaped as well. This gold square tanka which weighs around 10.9g was issued by him in the Hijri year 906. The obverse of this coin depicts the legend ‘Al wathiq Bi’l Samad Yazali Abul Muzaffar Nasir Shah’. The reverse of the coin depicts the legend ‘Bin Ghiyath Shah Al-Khalji Al-Sultan Khallada Mulkahu’.